I’ve pretty much decided that I’ve never met a cookie I didn’t like. I could bake cookies everyday of the week and never get tired of them—especially when it comes to any kind of chocolate chip cookies. I loved the sweet and salty thing going on with these cookies. 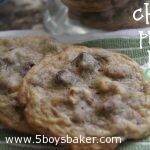 They are crispy but still chewy and absolutely yummy! The dough was amazing and I’m pretty sure I ate enough of it to have made 4 or 5 cookies . . .oh well life is short! Cream butter in a large mixing bowl until soft. Add eggs, water and vanilla. Beat until fluffy. Add flour, baking soda, and salt an dmix until well incorporated. Add pretzels and chocolate chips and gently stir in. Using a small cookie scoop, drop onto ungreased cookie sheets. Flatten each dough ball slightly with a glass or the palm of your hand.